SYNOPSIS: The breathtaking origins of thoroughbred horse racing. She's lonely and neglected, but she knows horses. Charlotte Wallace is orphaned and alone until a sympathetic stable boy takes her under his wing and teaches her everything about thoroughbred racing. In the process, the two discover in each other a love destined to be thwarted at every turn. Robert Devington has tried everything to persuade Charlotte's uncle to allow them to marry. Then an ill-fated friendship, a scandal in the making, and one desperate act of folly rob them of their love and his livelihood... Dead set on retribution, all Robert's hopes are hanging on one small horse-his only chance to reclaim his land, his dignity, and his love, against all odds. Let me start of by saying that when I accepted this book for review I was a little hesitant because I’m not really a horse person and have no knowledge of horse racing, but with my quest to broaden my historical fiction reading I thought I would give it a try. And, I am so glad I did!! 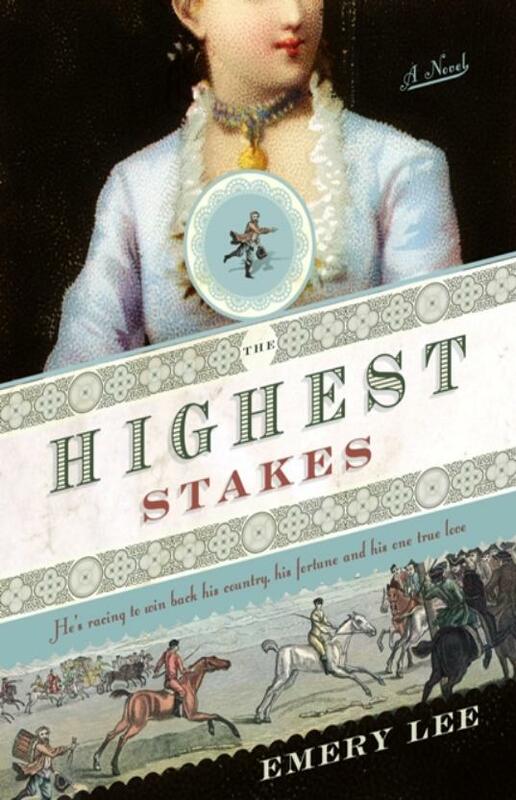 Emery Lee’s debut novel The Highest Stakes was a really fabulous read. Set in 18th century England, the main plot of the story is of Charlotte and Robert and their quest to be together despite Charlotte’s uncle’s disapproval. Charlotte is an orphan and being brought up in her uncle’s home, where Robert is the stable hand and they fall in love when Robert teaches Charlotte to ride. Now, that sounds like a pretty unoriginal plot, BUT that’s not all and here is where Emery Lee shines! The author throws in some twists of fate and a few surprises and you find yourself reading as fast as you can because you need to know what comes next! There are times the intricacies of either horse racing or the many horse origins can slow the story down a bit (especially if you’re not a horse person), but the author never dwells on it long and the story picks back up again. It’s apparent that the author really knows her stuff and I guess she should being a lifelong equestrian and all! Along with the charming and sweet Charlotte and the handsome Robert, Emery includes a fun and quirky cast of characters; from the mischievious rake Philip Drake whom you can't help but love, to Charlotte's hateful uncle Garfield Wallace bent on using Charlotte as a means to better his social standing and all of them in between. Since I also not a horse person I had been a little shy about reading this one, but hearing that you don't really have to be all that involved in horses to enjoy the story is great! I liked your review and will now have to take a closer look at this book. It does seem more than a little unusual, and I would probably enjoy it. Thanks!! Great review Amy! I just won this one from Blog O' the Irish. I love horses and I know a little about horse racing...a little. When I was about 11 or 12, it was all about the horse books for me. Black Beauty, among others. My parents briefly entertained getting us horses, but decided against it. Which was probably a good thing because by the time I hit high school I was a cheerleader and active in Drama so I wouldn't have had the time to spend with a horse. I still have a dream of owning horses someday. It may be a pipe dream, but I can dream...LOL! At least I'm still able to own my first love....Cats! Oops, sorry for the tangent! Anyway, I'm looking forward to reading this one. 18th century England and horses...a great combination! I think this book looks really interesting and different from a bunch of the other stuff that's out there. Glad you liked it! This should be an interesting book. You have the perfect villain, young love thwarted, a quest for revenge and to prove oneself all with the perfect setting. It sounds like one I'll enjoy. Thanks for the review. I'm glad you enjoyed and it's one I would like to read eventually. I love books that surprise us when we give them a chance. Seabiscuit is another horse book that surprised the heck out of me. I so wanted to review this book because it sounds so good! But alas, time didn't permit. I used to ride a little bit and love horses - so the concept immediately drew me in. Plus, like you, I'm trying to widen my reading subject matter - and this sounds wonderful, without being about kings and queens! Thanks for the review Amy! This one caught my eye based on the premise alone, but you review has convinced me that I need to read this!